Today I'm joined by my Dreamspinner sister, Katherine Halle. Like me, Katherine is a novella author! I want to thank Emma for having me here today. This is my first novella with Dreamspinner so I'm pretty excited. One of my MC's is Riley. Riley is twenty-eight, owns his own business and lives with his father. (It's cheaper and his father needs a bit of looking after – or so Riley thinks!). Riley is a bit of a chatterbox and basically would not keep his mouth shut. It was loads of fun to write him and he and Steve (the other main MC) got along like two peas in pod. Steve is a lawyer and his best friend Dale says he only talks when he's in court. Except Steve doesn't go to court a whole lot. Like ever. Riley talks enough for both of them though and Steve is surprised to find it charming instead of annoying. It doesn't take long for him to imagine evenings at home, sitting in the living room, listening to Riley chatter on about the events of his day. It's funny, it took me a while to realize it, but Riley reminds me of my kid. My kid is a total chatterbox. Could talk the leg off a dog! Flits from one subject to the next and really does not stop talking from the moment he wakes up to the moment he goes to sleep. At times, it can be exhausting. There are many times I say to my husband, "My ears are full." Or I tease my kid, "You've used up your allotted words for the day. If you speak anymore you will be using tomorrow's words and therefore will have to remain silent tomorrow." Despite all that and despite the fact that I really cannot write with all that chatter in the background? The house is almost too quiet when he is at school. So go figure. Anyway, writing Riley turned out to be a joy and I hope these two characters give me more of their story down the road because I would love to see what they're up to in about a year. And find out if Steve's ears eventually filled up. Thanks again to Emma for having me today! Heavy rains and strong winds slammed an uprooted tree through Steve Crowell’s roof, leaving a gaping hole to match the one in his heart. After his ex left him for a younger man, Steve’s not sure he’s ready to handle another disaster. His best friend highly recommended the contractor, but the man’s already late, and when he shows up with his music thumping, Steve isn’t impressed—until Riley steps out of his pickup truck. Personable, gorgeous Riley talks a mile a minute, which Steve finds both ridiculously endearing and terrifying. 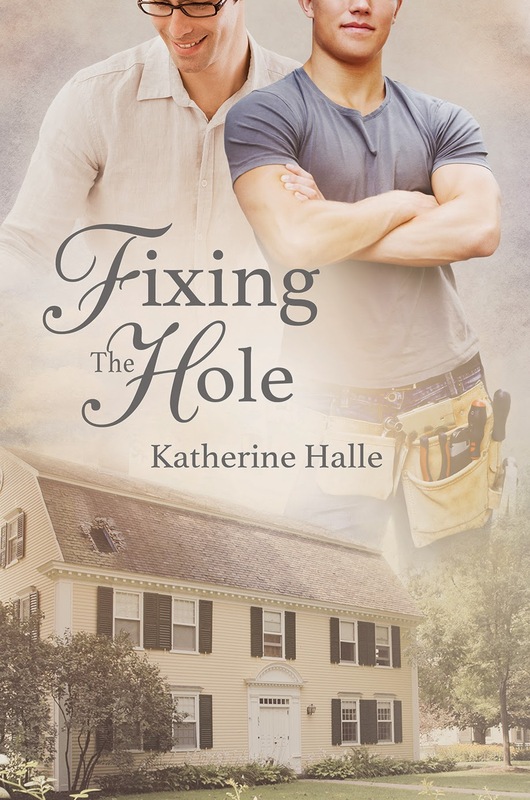 Piecing together a heart isn’t as easy as fixing a roof, but Riley might just be the right man for the job. I was just about to look at my watch again when I heard a pickup truck come rattling up the driveway, loud pop music blaring from the open window. Silence reigned when the engine cut off. I watched as a wiry young man opened the door and stepped out. I looked him over and took in the muscular legs shaped by a tight pair of jeans. My gaze roved over muscles barely contained by a fitted, army green Henley, finally landing on bright green eyes set in a young face under a military-style buzz cut of brown hair. "Hi." The young man strode forward, his hand outstretched. "I'm Riley Jones and you must be Steven Crowell. Sorry for being late. My dad tried to convince me to make him eggs and bacon instead of the oatmeal he should be eating for his heart, and he wouldn't let up until I promised to make him a big breakfast this weekend." Confused by this outpouring of information, I found myself stupidly saying, "Breakfast?" "Yeah, my mom died when I was in junior high, so it's been the two of us for so long that I just never moved out. I mean, I was gone during college, but then I came back, started my contracting business and it was just cheaper to live with him than get my own place. Then he had some heart trouble and if I don't make him eat right, he'll just eat burgers and fries or those god-awful frozen dinners all the time. And wow, sorry, I just keep talking, don't I? Why don't you show me what you need done, Mr. Crowell?"